So you've finally managed to setup your network connection, now what? How do you know that it's working? How do you know that you set it up correctly? And just what do you do now that it's setup? Well this chapter is for you. Slackware Linux includes a great many networking tools for troubleshooting and diagnosing network connection troubles, or just for seeing what's out there on the network. Most of these tools are command-line tools, so you can run them from a virtual terminal or in a console window on your graphical desktop. A few of them even have graphical front-ends, but we're going to deal almost exclusively with command-line tools for now. ping(8) is a handy tool for determining if a computer is operational on your network or on the Internet at large. You can think of as a type of sonar for computers. By using it, you send out a “ping” and listen for an echo to determine if another computer or network device is listening. By default, ping checks for the remote computer once per second indefinitely, but you can change the interval between checks and the total number of checks easily, just check the man page. You can terminate the application at any time with CTRL+c. When ping is finished, it displays a handy summary of its activity. ping is very useful for determining if a computer on your network or the Internet is available, but some systems block the packets ping sends, so sometimes a system may be functioning properly, but still not send replies. traceroute(8) is a handy tool for determining what route your packets take to reach some other computer. It's mainly of use for determining which computers are “near” or “far” from you. This distance isn't strictly geographical, as your Internet Service Provider may route traffic from your computer in strange ways. traceroute shows you each router between your computer and any other machine you wish to connect to. Unfortunately, many providers, firewalls, and routers will block traceroute so you might not get a complete picture when using it. Still, it remains a handy tool for network troubleshooting. Once upon a time, telnet(1) was the greatest thing since sliced bread. Basically, telnet opens an unencrypted network connection between two computers and hands control of the session to the user rather than some other application. Using telnet, people could connect to shells on other computers and execute commands as if they were physically present. Due to its unencrypted nature this is no longer recommended; however, telnet is still used for this purpose by many devices. Today, telnet is put to better use as a network diagnostic tool. Because it passes control of the session directly to the user, it can be used for a great variety of testing purposes. As long as you know what ASCII commands to send to the receiving computer, you can do any number of activies, such as read web pages or check your e-mail. Simply inform telnet what network port to use, and you're all set. As we mentioned, telnet may be useful as a diagnostic tool, but its unencrypted nature makes it a security concern for shell access. Thankfully, there's the secure shell protocol. Nearly every Linux, UNIX, and BSD distribution today makes use of OpenSSH, or ssh(1) for short. It is one of the most commonly used network tools today and makes use of the strongest cryptographic techniques. ssh has many features, configuration options, and neat hacks, enough to fill its own book, so we'll only go into the basics here. Simply run ssh with the user name and the host and you'll be connected to it quickly and safely. If this is the first time you are connecting to this computer, ssh will ask you to confirm your desire, and make a local copy of the encryption key to use. Should this key later change, ssh will warn you and refuse to connect because it is possible that some one is attempting to hijack the connection using what is known as a man-in-the-middle attack. The user and hostname are in the same form used by e-mail addresses. If you leave off the username part, ssh will use your current username when establishing the connection. So far all the tools we've looked at have focused on making connections to other computers, but now we're going to look at the traffic itself. tcpdump(1) (which must be run as root) allows us to view all or part of the network traffic originating or received by our computer. tcpdump displays the raw data packets in a variety of ways with all the network headers intact. Don't be alarmed if you don't understand everything it displays, tcpdump is a tool for professional network engineers and system administrators. By default, it probes the first network card it finds, but if you have multiple interfaces, simply use the -i argument to specify which one you're interested in.You can also limit the data displayed using expressions and change the manner in which it is displayed, but that is best explained by the man page and other reference material. Suppose you need to know what network services are running on a machine, or multiple machines, or you wish to determine if multiple machines are responsive?You could ping each one individually, telnet to each port you're interested in, and note every detail, but that's very tedious and time consuming. A much easier alternative is to use a port scanner, and nmap(1) is just the tool for the job. nmap is capable of scanning TCP and UDP ports, determining the operating system of a network device, probing each located service to determine its specific type, and much much more.Perhaps the simplist way to use nmap is to “ping” multiple computers at once. You can use network address notation (CIDR) or specify a range of addresses and nmap will scan every one and return the results to you when it's finished. You can even specify host names as you like. In order to “ping” hosts, you'll have to use the -sP argument. The following command instructs nmap to “ping” www.slackware.com and the 16 IP addresses starting at 72.168.24.0 and ending at 72.168.24.15. Should you need to perform a port scan, nmap has many options for doing just that. When run without any arguments, nmap performs a standard TCP port scan on all hosts specified. There are also options to make nmap more or less aggressive with its scanning to return results quicker or fool intrusion detection services. For a full discussion, you should refer to the rather exhaustive man page. The following three commands perform a regular port scan, a SYN scan, and a “Christmas tree” scan. Be warned! Some Internet Service Providers frown heavily on port scanning and may take measures to prevent you from doing it. nmap and applications like it are best used on your own systems for maintenance and security purposes, not as general purpose Internet scanners. Often network problems stem from a failure of DNS (Domain Name Service) which maps domain names to IP addresses. An easy way to perform quick DNS lookups is the host(1) command. When this is run, your computer will perform a few common DNS lookups and return the results. www.slackware.com is an alias for slackware.com. slackware.com mail is handled by 1 mail-mx.cwo.com. More complex DNS lookups can be manually performed with the dig(1) tool.dig is “the meanest dog in the pound” when it comes to troubleshooting DNS issues. With this tool, you can perform virtually any DNS lookup from reverse lookups to A, CNAME, MX, SP, TXT records and more. There are far too many command-line options and lookup types to go into depth here, but the man page lists all the common use cases. www.slackware.com. 86400	IN	CNAME	slackware.com. slackware.com. 86400	IN	NS	ns2.cwo.com. slackware.com. 86400	IN	NS	ns1.cwo.com. Let's take a took at the command-line options used above.The @207.69.188.185 argument tells dig what DNS server to query. If it is not specified, dig will simply use whatever servers are listed in /etc/resolv.conf.The a argument at the end is the type of DNS record to lookup. In this case we looked for an “A” record which returned an IPv4 address. finger(1) isn't exactly a network diagnostic tool as much as it is a network-user diagnostic tool. Using finger, you can gather a handful of useful information about users on servers running the fingerd(8) daemon. Today very few servers still offer fingerd, but for those that do it can be a useful tool for keeping track of your friends and co-workers. Slackware includes a variety of web browsers. If you're using a graphical desktop, you'll find Firefox, Seamonkey, and others you may already be familiar with, but what about console access? Fortunately, there are a number of capable web browsers here as well. A more feature-rich alternative is the popular links(1), a console-based web browser that supports frames and has better table rendering than lynx. Like its predecessor, links is navigable with the arrow keys, and the use of a mouse is supported.Unlike lynx, it also includes a handy menu (simply click on the top line with your mouse to activate) and generally formats web pages better. Unlike the other browsers we've looked at, wget(1) is non-interactive. Rather than display HTTP content, wget downloads it. This takes the “browsing” out of the web browser. Unlike the dump modes of other browsers, wget does not format its downloads; rather it copies the content in its exact form on the web server with all tags and binary data in place. It also supports several recursive options that can effectively mirror online content to your local computer.wget need not operate exclusively on HTTP content; it also supports FTP and several other protocols. Logging in as anonymous ... Logged in! ==> SYST ... done. ==> PWD ... done. ==> TYPE I ... done. ==> CWD /pub/slackware/slackware-current ...  done. ==> PASV ... done. ==> RETR ChangeLog.txt ... done. 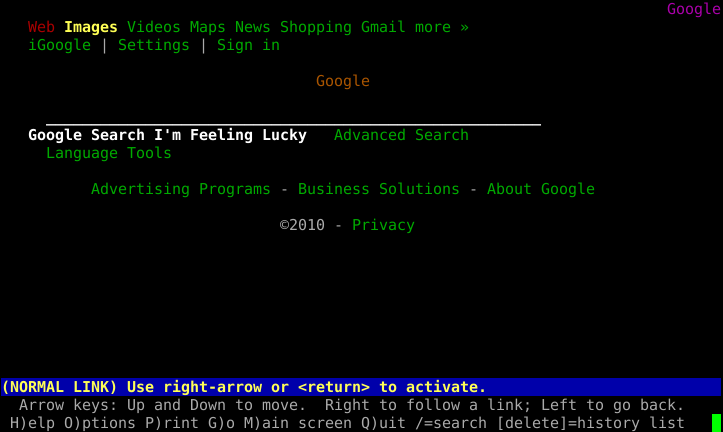 Slackware also includes a variety of email clients. If you're using a graphical desktop, you'll find Thunderbird, Kmail, sylpheed and others. As with web browsers, there are also applications that function within the shell. Once you start using an email client in the console, you may find yourself not wanting to use anything else; the flexibility and configurability can be addicting. pine is one of the oldest command-line interface mail clients still in existance and remains one of the most user-friendly. pine was created by the University of Washington and carries with it both a trademark and a copyright license that are difficult to work with. Thankfully back in 2005, the university saw fit to re-write it without the trademark and with a more open license, so alpine(1), the pine-clone distributed with Slackware, was born. Before configuring any mail client, you should check the documentation of your mail server to gather all of the pertinent information about what protocols and security measures your mail service uses. This will help you configure pine correctly. By default, pine will check for new e-mails delivered to a mail service running on your computer. Unless you're actually running such a mail service (many people do) this probably isn't what you want. Fortunately configuring pine is a straight forward process. Simply enter the [S]etup menu and chose the [C]onfig option. You'll be given an option to enter you name, mail path, SMTP server, and many other options. Some people don't like pine. Some people want more control. Some people want a fully-configurable mail client with plugin support and a no-nonsense attitude. Those people use mutt(1). mutt isn't as user friendly as pine, but makes up for it with power. You won't find the user-friendly command reference at the bottom of the screen, mutt uses every last inch of real-estate for mail processing duty. It's feature support is extensive - threaded displays are no problem for the mighty mixed-breed! You can configure mutt with a .muttrc file in your home directory. With all the many different possible configuration options, there's even a man page for that, muttrc(5). You might want to read up on it. Using mutt is unique because it is by nature a Mail User Agent (MUA), meaning its true purpose is to read and sort email. This was its only job originally, although some additional features such as retrieving mail via POP3 and even very basic transfering messages via SMTP have snuck into the application. As is so often the case with robust console-based applications, the configuration options are myriad, and there is no “right” or “wrong” way of using mutt as long as it does what you want it to do. One thing to keep in mind if you are considering using mutt for mail handling is that its mail sending and receiving abilities are very limited. mutt focuses solely on sorting, reading, and composing mail messages in addition to other traditional Mail User Agent duties. This is keeping in focus with the UNIX philosophy of small tools that do one thing very well and which can be combined (or “chained”) with other tools to complete whatever tasks are required. With this in mind, you'll likely need to setup some external tool to receiving mail at a minimum. The commands used to navigate around in mutt are highly customizable but the defaults can be listed by typing ?. So those are great and everything, but what if you just want a mail client that isn't menu-driven? Thankfully mailx is here to save you. mailx is based on the Berkeley Mail application, with a mail command appearing as early as Version 1 of AT&T's UNIX. It can be used either interactively or non-interactively. mailx reads mail from your computer's mail spool and displays the usual combination of sender, subject, status, and size in a list, leaving the user at an interactive prompt. In fact, it might look familiar to you if you bothered checking your mail immediately after installing Slackware and read Pat Volkerding's greeting. Heirloom mailx version 12.4 7/29/08.Type ? for help. N2 To rootThu Mar 10 23:35321/15417 Welcome to Linux (Slackware 14.0)! To read a message, enter the number of the message at the prompt. This displays the message using more, so use the RETURN key to view the next page. Once the end of the message has been reached, press q to return to the list view, or RETURN to continue to the next message. To see a list of available commands, enter ? at the mail prompt; using the commands provided, you can view the headers of mail in the spool, reply, delete, save, and many other common email tasks. mailx is most powerful when used in scripting. For all of the options available for mailx, view its man page. A simple way to send an email to someone requires only the command itself and the destination address. After the command has been issued, an interactive prompt appears for a subject line, the message body, and the end character (a single period on an otherwise empty line). mailx can be used entirely without human intervention, however. Generally, it's safe to assume that any attribute you can define in the interactive shell for mailx can also be defined while scripting it or using it as one non-interactive command. In this example, the contents of the file message.txt would be sent as the message body to the specified recipient. No interaction from the user is required. In this case, the MAILRC variable is set to /dev/null in order to override any system defaults, and the smtp server as well as the FROM: line are defined. The rest of the command is the same as using mailx internally within one's own computer or network. Over all, mailx is usually viewed as a mail client with the bare-minimum features; this is largely true, but when you need to be able to script sending notification emails or important update messages, it quickly becomes a lot more valuable than a fully interactive application like pine or mutt. Lots of data is stored on FTP servers the world over. In fact, Slackware Linux was first publically offered via FTP and continues to be distributed in this fashion today. Most open source software can be downloaded in source code or binary form via FTP, so knowing how to retrieve this information is a handy skill. The simplest FTP client included with Slackware is named simply, ftp(1) and is a reliable if somewhat simple means of sending and retrieving data. ftp connects to an FTP server, asks for your username and password, and then allows you to put or get data to and from that server. ftp has fallen out of favor with more experienced users do to a lack of features, but remains a handy tool, and much of the documentation you see online will refer you to it. Once an FTP session has been initialized, you'll be placed at a prompt somewhat like a shell.From here you can change and list directories using the “cd” and “ls” commands, just like a shell.Additionally, you may issue the “put” command to send a file to the server, or a “get” command to retrieve data from the server. If you're connecting to a public FTP server, you'll want to use the “anonymous” username and simply enter your e-mail address (or a fake one) for the password. ncftp(1) (pronounced nick-f-t-p), is a more feature rich successor to ftp, supporting tab completion and recursive retrieval. It automatically connects to a server as the anonymous user, unless you specify a different username on the commandline with the -u argument. The primary advantage over ftp is the ability to send and retrieve multiple files at once with the “mput” and “mget” commands. If you pass the -R argument to either of them, they will recursively put or get data from directories. The last client we're going to look at is lftp(1).Like ncftp, it supports tab completion and recursive activity, but has a more friendly license.Rather than user “mget” and “mput”, all recursive operations are handled with the “mirror” command.“mirror” has many different options available, so I'll have to refer you to the man page and the built-in “help” command for complete details. Ready to see something cool? Have you ever found yourself needing just a handful of files from a large directory, but you're not entirely sure which files you already have and which ones you need? You can download the entire directory again, but that's duplicating a lot of work. You can pick and chose, manually check everything, but that's very tedious. Perhaps you've downloaded a large file such as an ISO, but something went wrong with the download? It doesn't make sense that you should have to pull down the entire file again if only a few bits have been corrupted.Enter rsync(1), a fast and versatile copying tool for local and remote files. rsync uses a handful of simple, but very effective techniques to determine what needs to be changed. By checking file size and time stamps, it can determine if two files are different. If something has changed, it can determine what bytes are different, and simply download that handfull of data rather than an entire file. It is truly a marvel of modern technology. In its simplist form, rsync connects to an rsync protocol server and downloads a list of files and directories, along with their sizes, timestamps, and other information. It then compares this to the local files (if any) to determine what it needs to transfer. Only files that are different will be synced.Additionally, it breaks up large files into smaller chunks and compares those chunks using a quick and simple hash function. Any chunks that match are not transferred, so the amount of data that must be copied can be dramatically reduced.rsync also supports compression, verbose output, file deletion, permission handling, and many other options. For a complete list, you'll need to refer to the man page, but I've included a small table of some of the more common options. Due to the power and versatility of rsync, it can be invoked in a number of ways.The following two examples connect to an rsync protocol server to retrieve some information and to another server via ssh to encrypt the transmission.